Hello sweet friends! Truly, grace be with you . . . this is a stamp that has been sitting on the counter for some time. I’ve always thought this was a lovely wish and a sweet thing to say to someone, so I’m saying it to you all. I’m sharing a card with that sentiment today for Day of Giving Friday. I’ve just finished a deadline that I’ve been working on for some time so today finds me optimistically looking forward to the days to come. The days have been so full of ‘have to do’s’ that maybe, just maybe in the next week or two, I’ll be able to squeeze in a ‘want to do’. I hope you do that too! ‘Me’ time always makes you tick better. So on to my card for today. This is a 5.5″ x 7.5″ layered card – I used Spellbinders Graceful Brackets for the petite scallops in the cream for a pop of color at the top of the card. Next I layered on Spellbinders Arched Swallowtail Pennants in cream – the largest one, cut in half. Next I layered on the second largest Arched Swallowtail Pennant (kraft colored) and then glued down Spellbinders Oval Ironwork (in pink) on top. Then lastly three layers of the third largest Arched Swallowtail Pennant. I split one of the cream Pennants in half vertically and spread so that I would get a mat layer and then I did the same thing horizontally for a mat layer. The last pennant (kraft colored) sits on top and is the place I put that lovely sentiment. For new readers, every Friday it’s my pleasure to give away a card. The card goes to a randomly picked reader (worldwide) who leaves a comment in our conversation. Want to know more about Day of Giving, here’s a link to my FAQ’s just check out #11. You can check the list of winners HERE! For your comment: Tell me about a time you witnessed an inspiring act of kindness. Thanks so much for stopping by! I’ll be popping back up soon! This is a most glorious card today, thank you. Now then, I’ve to tell you about the time I’ll never forget, I remember mam coming home from the shops before I went to school and she had brought me some chocolate sweets. It was when rationing was on after World War 2 and I still remember the taste. Beautiful! I would love to win one of your Cards! I have a Painting that just says, “Grace”. 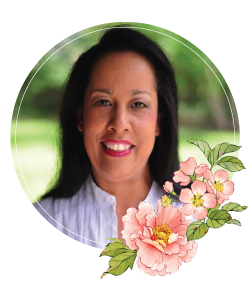 I have had to learn to give Grace to myself which is very hard for me to do, but it is so easy to give to others. I have come to find out that God can still use me no matter what my conditions are or finances, or even circumstances I am in. What a beautiful card! This is one that takes some time to savor because there is so much going on. I know I witness acts of kindness many times a day, but the one that came immediately to mind is this: My office is next door to a vet and my window overlooks the parking lot. An older couple came with a dog but I noticed they were leaving without it. The woman was sitting in the car and I saw her husband approaching with the vet. The vet squatted next to the car to be at eye level and touched her in consolation. This is a busy, busy doctor and so taking this time with her really touched me. No matter how busy you are, dear friend, you take the time to reach out to all of us. I feel touched by your grace and it is so appreciated. Good morning Becca, such a pretty card and the sentiment!!! Wow I remember when I was in Disney MGM Studios in the middle of a storm singing I’m singing in the rain!!! Only mad dogs and English women go out in the mid day Sun!! What fun I had that day!! !Oh happy times!!! Becca you really make my day Bless you!!! Sorry Becca I only got tell me about a time you. Acts of kindness so many!!! 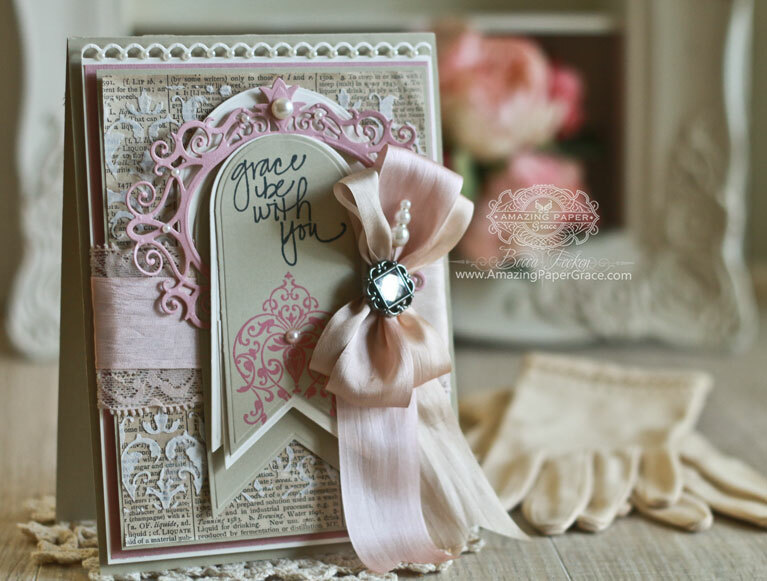 This is just so lovely, love how you used the swallowtail penants, the kraft and pink combination. Thanks for answering my note on Instagram. Haven’t had a chance to use your new dies yet but maybe this coming week. Having retired from public service job, I have seen so many inspiring acts of kindness I can’t even begin to name just one!! Have a great weekend and week ahead, My Friend! Another beauty Becca! 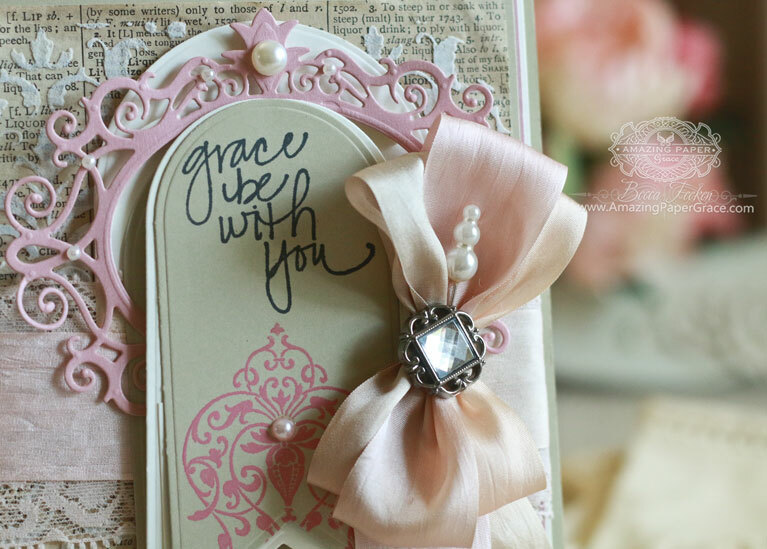 What a stunning card and I love the sentiment and stick pin. Of course the bow is another masterpiece! A true Becca card its lovely !!! I witnessed an act of kindness recently I actually performed it lol. who is a real lady and in hospital . told her I had her just where I wanted her . 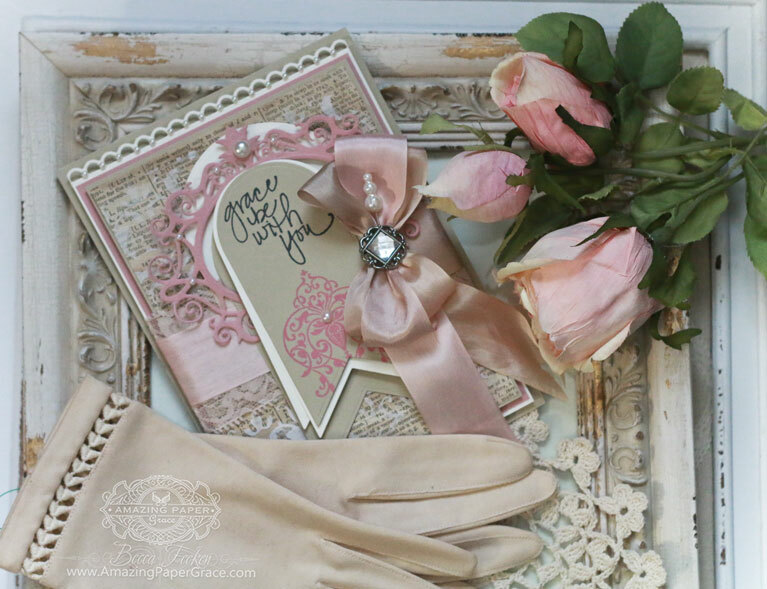 What a beautiful sentiment for your lovely card today. I’ve visited the US from the UK a few times in the last ten years or so. On my first visit I was attending a Red Hat Society convention in Wichita Falls, Texas when I became so ill with the ‘Texas Crud’ that I was taken into hospital there. The convention came to me in hospital, nearly everyone came to visit. After my stay in hospital a very special lady came to collect me from over 100 miles away and I stayed with her until I was passed as fit to fly. I had only known her a few days before this and her kindness to me in opening up her home and caring for me will stay with me forever. This card would be for her. Hi Becca, May grace be with you too !! This card is so elegant, the colours are beautiful together, and your bow is to die for, I love it !! I got my frame maker this week, so will need the border dies next, can’t wait !! You are such a treasure! May grace be with you too! Not something I witnessed, but a story about my aunt when she was a little girl that confirmed my view of what a special person she was. My aunt was 6, it was her first sports day and she was a very good runner. As she neared the finishing tape well ahead of the other children, she turned, stopped dead in her tracks and then ran back to hold hands with the little girl who was bringing up the rear. They crossed the finishing line together :o) I lost her 2 years ago and I think of that story every time I think of her! What a wonderful card here again Becca, it’s really beautiful. saying hello a little late this week.This card is cute! My inspiring act of kindness has to be from my 9 yr old daughter this week. We were out last Saturday & she happened to find a $20 note on the ground. As there was nobody about who may be able to claim it I told her she may keep it. She asked me if she was able to do whatever she wanted with it or spend it on whatever she wished. I told her that was ok. (I always tried to teach my kids with birthday money etc to spend a little & save the rest). In Australia during Lent season we get little money boxes from church (project compassion) to donate money from sacrifices we have made during easter Lent season eg:place money in box for that cup of coffee we gave up. I have to say it melted my heart! Being a parent in this day & age can test you, but at least I now know I have done something right! Hi Becca. Beautiful card in gold and white and stunning bow. I love this card. Simple but elegant. 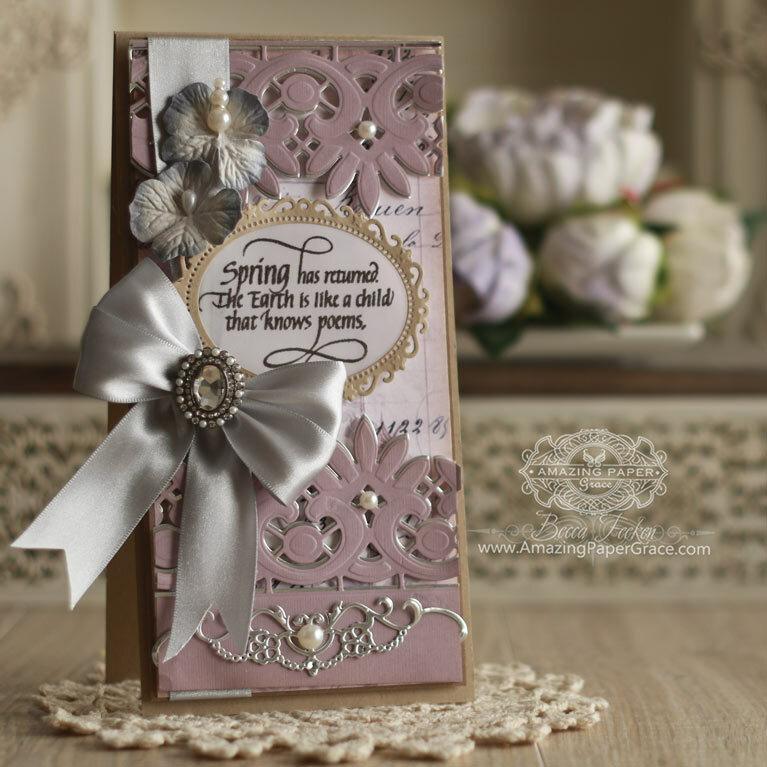 Thank you for sharing this gorgeous card Becca.